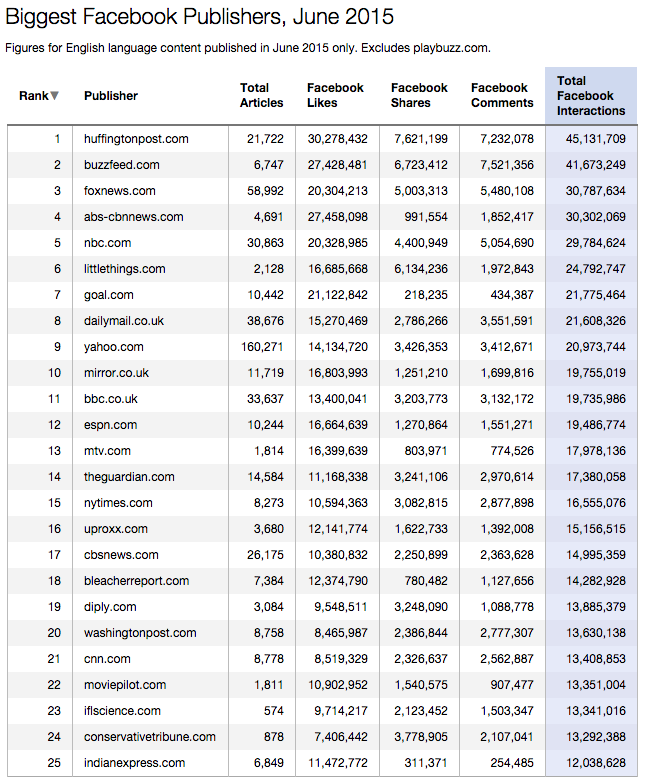 A new report from NewsWhip has found that The Huffington Post was the most shared content publisher on Facebook in June. BuzzFeed came in second, along with many of the other usual suspects like Fox News, CNBC, Yahoo and The Guardian - but most interestingly, clickbait and sensationalized content-style sites continue to rank well, alongside their more serious news rivals. Among the big players listed, you'll notice two lesser known sites taking prominence - Little Things and Diply. Little Things publishes viral content with articles like "Which Famous Musical Sequence Are You?" and "This Starving and Abandoned Baby Bear Cub Was Rescued by One Hero Rafter", while Diply produces much the same ("16 Terrifying Deaths You Forgot Took Place in Your Favorite Disney Movies"). The two highlight that despite Facebook's push into serious publisher territory, there's still very much a place for click-bait style content on The Social Network - and there likely always will be. This is supported by the additional notes in NewsWhip's findings - despite Huffington Post holding a lead of almost a million over BuzzFeed in total Facebook shares for the month, there was a gap of less than 10% in overall engagement between the two. BuzzFeed also published less than a third of the amount of content that Huffington Post did for the month, again underlining the massive popularity of BuzzFeed content among Facebook users. 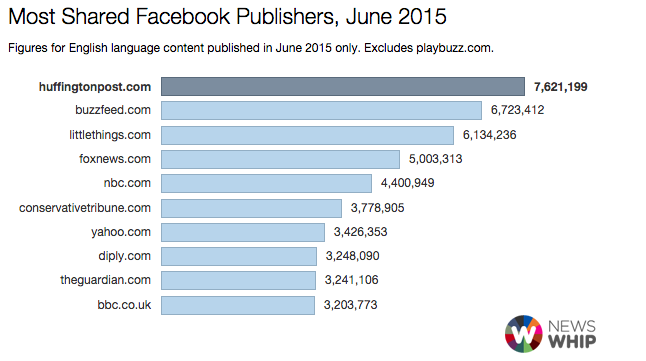 "Despite being responsible for some of the most viral content on Facebook this year, Playbuzz has become a platform where publishers create and embed 'Playful Content' for their audiences, rather than being publisher itself. As such, they asked not to be included in these rankings." "Just two new Instant Articles, from the Guardian and Germany's Bild, have appeared on Facebook's dedicated Instant Articles page since May. We've heard that these posts are still being tested rigorously by Facebook engineers, and it could be some time yet before the feature is being deployed regularly. Recent reports suggest that "the articles have only been available to a small test audience of 5% of iOS mobile users in the U.S," which explains their continuing lack of visibilty. Once the tests conclude however, we're likely to see increased engagement around stories with an 'Instant' component." So while your News Feed hasn't been filled with Instant Articles as yet, testing is proceeding and Facebook is working towards a wider push on Instant content. It's likely you'll be seeing more of these in the near future. Above all, the figures show that while news content is important to Facebook users, viral stories still have a very strong presence, and resonate very well within the Facebook eco-system. In terms of total shares on the platform, BuzzFeed and Little Things come in at 2nd and 3rd place respectively, behind Huffington Post, yet both of them are only producing a fraction of the content of the bigger players (Little Things only produced 2,128 articles for the month, the fifth lowest amount among the top 25). Love them or hate them, people are more inclined to click through and find out "what happens next...", a point worth taking note of in your own content efforts. Of course, you probably don't want to be producing click-bait, but content that engages the audience, that involves an emotional pull or a nostalgic lure, can be very powerful and can provide a significant boost in organic shares, when utilized effectively.